It's happened once before, and was so much fun I had to do it again. At this most recent and amazing SCBWI Conference, I collected and gave out business cards as I met and chatted with some of the most fascinating writers, illustrators, agents, editors, art directors and industry professionals. The HARBINGER 02.02.2012 Lanyards, promoting my friend Sara Wilson Etienne's debut novel coming out from Putnam/Penguin! Check out how cool this is! 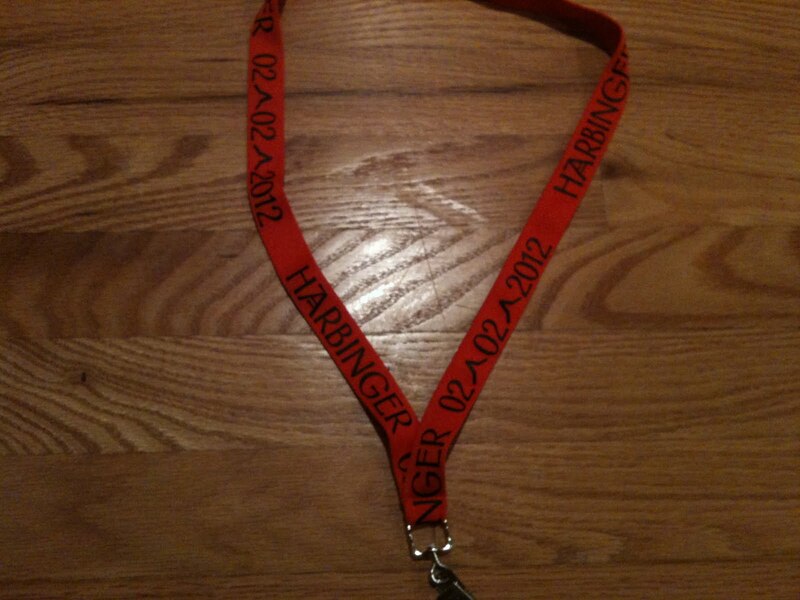 I wore mine (along with my red RA Lanyard) all weekend as did hundreds of other attendees. 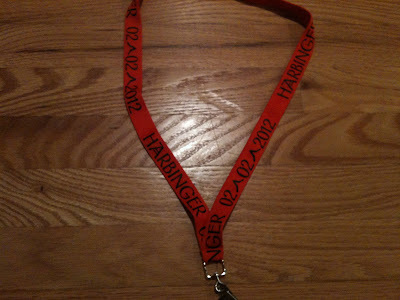 In fact, at our Los Angeles Kid Lit Drink Night, there was a sea of the distinctive orange HARBINGER swag on display. So Sara, for your ComicCon-inspired marketing moment of brilliance in being the first kid lit person I've seen to bring hundreds of customized lanyards promoting their novel to a SCBWI conference, you have won... well, I guess it's really just bragging rights. And if you have an entry you think could win, introduce yourself to me at the upcoming New York SCBWI Winter Conference (#NY12SCBWI) and let's swap cards! This gives me incentive to get creative with my business card before attending a conference out your way. And kudos to you for promoting an area of an author's business life that sometimes gets forgotten. An area that should be about fun!